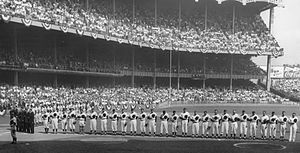 The 1955 World Series matched the Brooklyn Dodgers against the New York Yankees, with the Dodgers winning the Series in seven games to capture their first championship in franchise history. It would be the only Series the Dodgers won while based in Brooklyn, as the team relocated to Los Angeles after the 1957 season. This was the fifth time in nine years that the Yankees and the Dodgers met in the World Series, with the Yankees having won in 1947, 1949, 1952, and 1953; the Yankees would also win in the 1956 rematch. Dodgers: Walt Alston (mgr. ), Roy Campanella, Sandy Koufax (dnp), Pee Wee Reese, Jackie Robinson, Duke Snider, Tom Lasorda (dnp)‡..
NBC. This was the first World Series televised in color. This was the sixth World Series contested between the Yankees and Dodgers; the Yankees had won each of the five prior matchups (1941, 1947, 1949, 1952, and 1953). New York manager Casey Stengel had played for the Dodgers from 1912 through 1917. Roy Campanella (at left) and Yogi Berra were the 1955 MVPs for the National League and American League, respectively. The NL champion Dodgers finished the regular season with a record of 98–55, ​13 1⁄2 games ahead of the Milwaukee Braves. Offensive team leaders were Duke Snider (.309 batting average, 42 home runs, 136 RBIs, .628 slugging percentage, and 1.046 OPS) and Roy Campanella (.318 batting average, 32 home runs, 107 RBIs, .583 slugging percentage, and .978 OPS). Pitcher Don Newcombe led the team in wins, with a 20–5 record, and ​233 2⁄3 innings pitched. Campanella was voted the National League MVP, narrowly edging Snider. The AL champion Yankees finished the regular season with a record of 96–58, three games ahead of the Cleveland Indians. Offensive team leaders were Mickey Mantle (.306 batting average, 37 home runs, 99 RBIs, .611 slugging percentage, and 1.042 OPS), Yogi Berra (.272 batting average, 27 home runs, 108 RBIs, .470 slugging percentage, and .819 OPS), and Bill Skowron (.319 batting average). Pitcher Whitey Ford led the team in wins, with an 18–7 record, and ​253 2⁄3 innings pitched. Berra was voted the American League MVP, while Mantle finished fifth. In Game 1, Carl Furillo's leadoff home run in the second off Whitey Ford put the Dodgers up 1–0. Jackie Robinson then tripled with one out and scored on Don Zimmer's single, but in the bottom of the inning, after a walk, rookie Elston Howard, in his first World Series at bat, homered to tie the game off Don Newcombe. Duke Snider's leadoff home run next inning put the Dodgers back in front 3–2 (which would eventually help establish a new HR record for a seven-game series at 17), but in the bottom half, the Yankees again tied the score on Irv Noren's RBI groundout with runners on second and third. Joe Collins's leadoff home run next inning put the Yankees ahead 4–3. His two-run home run in the sixth extended their lead to 6–3. In the seventh, after a single and error by third baseman Gil McDougald put runners on second and third with one out, Zimmer's sacrifice fly scored a run, then Robinson stole home to cut the Yankees' lead to 6–5, but Ford pitched eight innings for the win while Bob Grim earned the save with a scoreless ninth to give the Yankees a 1–0 series lead. In Game 2, Pee Wee Reese lead off the top of the fourth with a triple and scored on Duke Snider's single off Tommy Byrne, but in the bottom of the inning, after a two-out single and walk, back-to-back RBI singles by Elston Howard and Billy Martin tied the game. After a hit-by-pitch loaded the bases, Byrne's two-run single put the Yankees up 4–1 and knock starter Billy Loes out of the game. The Dodgers got a run in the fifth on Jim Gilliam's RBI single with Jackie Robinson at third, but could not score again off Byrne, who pitched a complete game to give the Yankees a 2–0 series lead heading to Brooklyn. In Game 3, Roy Campanella's two-run home run after a walk off Bob Turley in the first put the Dodgers up 2–0, but in the second, Mickey Mantle hit his only home run of the series. Bill Skowron then doubled and scored on Phil Rizzuto's two-out single to tie the game. In the bottom of the inning, two singles and a hit-by-pitch loaded the bases before walks to Jim Gilliam off Turley and Pee Wee Reese off Tom Morgan put the Dodgers up 4–2. In the fourth with two on, Campanella's RBI single and Carl Furillo's sacrifice fly extended the Dodgers' lead to 6–2. In the top of the seventh, Rizzuto walked with two outs and scored on Andy Carey's triple, but in the bottom half, Jackie Robinson doubled with one out off Tom Sturdivant and scored on Sandy Amoros's single. After a forceout and walk, Reese's RBI single extended the Dodgers' lead to 8–3. Johnny Podres pitched a complete game as the Dodgers cut the Yankees' series lead to 2–1. This was the last World Series game to be played in the month of September. Gil McDougald's one-out home run in the first off Carl Erskine put the Yankees up 1–0. In the second, Joe Collins drew a leadoff walk, moved two bases on two groundouts, and scored on Phil Rizzuto's single. In the third, Sandy Amoros drew a leadoff walk off Don Larsen and scored on Jim Gilliam's RBI double. In the top of the fourth, after a leadoff walk and single, Don Bessent relieved Erksine and allowed an RBI single to Billy Martin, but in the bottom of the inning, Roy Campanella hit a leadoff home run and after a single, Gil Hodges's two-run home run put the Dodgers up 4–3. Duke Snider's three-run home run next inning off Johnny Kucks extended their lead to 7–3. In the top of the sixth, Elston Howard hit a leadoff single off Clem Labine and scored on Billy Martin's double. One out later, Eddie Robinson's RBI single cut the Dodgers' lead to 7–5, but the Dodgers added a run in the seventh on three consecutive leadoff singles by Campanella, Carl Furillo and Gil Hodges off Rip Coleman. Labine earned the win with 4 1/3 innings to close as the Dodgers tied the series with an 8–5 win. In Game 5, Sandy Amoros's two-run home in the second off Bob Grim put the Dodgers up 2–0. Next inning, Duke Snider's lead off home run made it 3–0. The Yankees got on the board in the fourth on Billy Martin's RBI single with two off rookie Roger Craig, but Snider's second home run of the game in the fifth gave the Dodgers that run back. Home runs by Bob Cerv in the seventh off Craig and Yogi Berra in the eighth off Clem Labine cut the Dodgers' lead to 4–3, but Brooklyn added an insurance run in the bottom of the eighth off Bob Turley when Carl Furillo hit a leadoff single, moved to second on a sacrifice bunt, and scored on Jackie Robinson's single. Laine pitched 2 2/3 innings in relief for Craig, who won his first World series start, for the save as the Dodgers were one win away from the championship. Snider became the only player from either league with four home runs in two different Series. In Game 6, the Yankees scored all five of their runs in the first off Karl Spooner. After two walks, back-to-back RBI singles by Yogi Berra and Hank Bauer put them up 2–0 before Bill Skowron capped the scoring with a three-run home run. Whitey Ford pitched a complete game, allowing one run (on Carl Furillo's RBI single in the fourth) and four hits as the Yankees forced a Game 7 with a 5–1 win. The Dodgers scored the game's only runs on a fourth inning RBI single (after a double) and sixth inning bases-loaded sacrifice fly, both by Gil Hodges. With runners on first and second and one out, left fielder Sandy Amorós made a dramatic game-saving catch of a deep fly ball down the left field line off the bat of Yogi Berra in the sixth inning, to start a double play. Amorós then threw to Pee Wee Reese and Reese relayed to Gil Hodges, who tagged Yankee Gil McDougald before McDougald could get back to first. This stymied possibly the Yankees' best chance of the day. This would be the only time in Jackie Robinson's career when he did not play in his team's World Series game. Don Hoak replaced Robinson in the line-up, and played third base. For the first time in Series history, an MVP was selected—Johnny Podres, winning pitcher of Games 3 and 7. He was 2–0, both wins being complete games including the series-clinching Game 7 shutout, and had a 1.00 ERA. Notes: Adjusted for inflation, winning and losing player's shares are $91,358 and $52,366 respectively, as of 2018. ^ "1955 Brooklyn Dodgers Statistics". Baseball-Reference.com. Retrieved October 21, 2018. ^ a b "1955 Awards Voting". Baseball-Reference.com. Retrieved October 21, 2018. ^ "1955 New York Yankees Statistics". Baseball-Reference.com. Retrieved October 21, 2018. ^ "1955 World Series Game 1 – Brooklyn Dodgers vs. New York Yankees". Retrosheet. Retrieved September 13, 2009. ^ "1955 World Series Game 2 – Brooklyn Dodgers vs. New York Yankees". Retrosheet. Retrieved September 13, 2009. ^ "1955 World Series Game 3 – New York Yankees vs. Brooklyn Dodgers". Retrosheet. Retrieved September 13, 2009. ^ "1955 World Series Game 4 – New York Yankees vs. Brooklyn Dodgers". Retrosheet. Retrieved September 13, 2009. ^ "1955 World Series Game 5 – New York Yankees vs. Brooklyn Dodgers". Retrosheet. Retrieved September 13, 2009. ^ "1955 World Series Game 6 – Brooklyn Dodgers vs. New York Yankees". Retrosheet. Retrieved September 13, 2009. ^ "1955 World Series Game 7 – Brooklyn Dodgers vs. New York Yankees". Retrosheet. Retrieved September 13, 2009. Cohen, Richard M.; Neft, David S. (1990). The World Series: Complete Play-By-Play of Every Game, 1903–1989. New York: St. Martin's Press. pp. 254–258. ISBN 0-312-03960-3. Reichler, Joseph (1982). The Baseball Encyclopedia (5th ed.). Macmillan Publishing. p. 2163. ISBN 0-02-579010-2. Drebinger, John (October 4, 1955). "For Brooklyn, This Is Next Year". The New York Times. Retrieved November 5, 2011.